“I’m concerned, but not afraid”, Omar Al-Rawi, a Bagdad-born member of the Vienna’s city council, observes as the results of the snap election in Austria are relayed across the country. Two right-wing parties, the conservative ÖVP and far-right FPÖ, both of which relied heavily on anti-Muslim rhetoric prejudice in the campaign, came first and third respectively. Now, they’re expected to form a government together. “To see that Austria has a majority of nearly 60% of right wing voters is not something that would make me happy. I think anti-Muslim rhetoric will continue, but I know Austria is strong enough to manage it“, Al-Rawi adds. His mixture of anxiety and optimism is understandable as he was a candidate of the left-wing SPÖ party, which despite better-than-expected results in Vienna will likely have to relinquish its hold on power in the country after finishing behind ÖVP nationally. His view is reflected by others who share his religion and have confidence in Austria’s ability to protect their rights. The Favoriten is a working-class district which is home to one of the largest Muslim populations in Vienna. In the Attaysir mosque Dawid, an eloquent student from Chechnya, who fled conflict to come to Europe recalls how things have changed since he arrived in 2008. “Things looked different [Then]… now, people don’t like us”, he claims, adding, surprisingly, that he can understand the tensions. “This is a Christian country. They do what they want. If you go to Turkey or Saudi Arabia, and start to discredit Islam, the reaction will be the same”. “If I can study and work, that’s ok. If they try to touch me or my family, I will tell them to step back”, he adds admitting that he himself has never experienced any sort of prejudice. In Austria, there are around 700,000 Muslims from a range of different ethnicities and backgrounds. Unlike many other countries in Europe, Austria has long history of integration with Islam. As early as 1912 Austro-Hungarian empire formally recognised the religion within its legal system. The Muslim community has been rooted in the nation’s society since the 1960s when workers began moving from the south and east. “The public mood changed in the late 1990s, when politicians discovered that the Muslim issue is effective to mobilize voters”, said Carla Amina Baghajati, spokeswoman for the Austrian Islamic Religious Authority. “I’m not afraid either”, she admits. “I have trust in the rule of law”. But what Baghajati is concerned about is that terrorism or the refugee crisis are being mixed up with the situation of Muslims in general. “It should be the other way round. Those who have a longer history in Austria should be used to help to solve these problems, not labeled as enemies”. The far-right FPÖ has always relied on attacking Islam, whether in the person of Jörg Haider twenty years ago or more recently Norbert Hofer, narrowly edged out in the 2016 presidential election. During the past few months, though, the conservative ÖVP took a similar line. 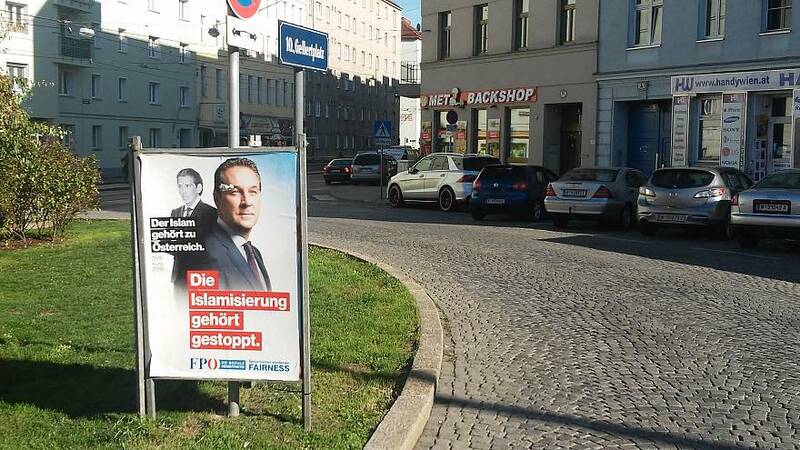 In the race against the FPÖ – whose campaign slogan was “Islamisation must be stopped” – conservatives were vocal about protecting the country’s borders, fighting political Islam and limiting immigration. They used as ammunition methodologically questionable reports which highlighted issues like the supposed teaching of radical Islam in kindergartens. But, even though some reports were clearly misleading, it doesn’t mean there’re no reasons to be concerned, critics say. The intelligence service didn’t respond to further questions about the number of asylum seekers suffering from any sort of crimes. “Not all asylum seekers are Muslims”, says Astrid Mattes, a scholar on race, ethnicity, and politics at the University of Vienna, recalling that Austria stopped counting religious affiliation in 2001. “Regarding the high numbers of criminal charges, a lot of factors come into play. This is partly due to structural reasons and the limited possibilities these people have. There’re many men coming and they’re legally not permitted to work”, she adds. According to Mattes, it was relatively easy to heat emotions against the Muslim community as in Austria distrust of strangers and even xenophobic attitudes are widespread. “These are popular feelings that have been here for decades, and the right-wing leader played on them”, she claims. Strangely enough, Sebastian Kurz, ÖVP leader, who will likely become the youngest prime minister in Austria’s history, was previously known as the liberal face of his party. In fact, at the start of his political career, he was put in charge of the newly-established integration office at the interior ministry, a position which allowed him to get to know the community very well. “He was very encouraging”, Baghajati of the Austrian Islamic Religious Authority, recalls of Kurz from that period. They’ve worked on several integration projects together. “I remember that during one meeting, he stayed longer to listen to a group of Muslim women who asked him to help with some issue. To their surprise, the same evening they received calls from his office saying the issue will be solved”. But as soon as he became a leader of the ÖVP, he set a new tone. “You must always do politics in accordance to the situation you are in”, said Josef Höchtl, veteran ÖVP politician, and former chairman of ÖVP’s youth team, a position that Kurz also held. In 2015, with strong public support, Austria took in roughly 90,000 asylum seekers, more than 1 percent of its population. A year later, with backing for the policy falling away sharply, Kurz, as a foreign minister, contributed to closing the Balkan route. “If we continued taking them, it would ruin not only our cultural system but also our system of social security”, Höchtl says. “One must differentiate normal Islamic religion from radical Islamism, and yes, the latter will be thrown out from the country”. In the Favoriten district, only a few seem to care. Older men sip tea on the benches in front of the mosques, children jump around. Those who participated in the election mainly seem to have voted for the left-wing SPÖ, or at least that’s what a straw poll on the street suggests.All see dialogue and reconciliation as the way forward after the sound and fury of the campaigns have passed.